Brillant! Can't speak highly enough of this book! Such a great story and so well written. 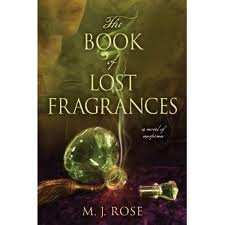 So many aspects that I love and am intrigued by - Egyptology, aromatherapy and reincarnation - all rolled into one riveting story. For those of you who cannot stand a story without a love story - it's there. If you want a thriller - it's there. If you want history, ancient and more contemporary - it's there. So is science and a host of other issues that all wind around each other to create one of those intricate Chinese decorative knots, each strand necessary and holding together the whole. Towards the end, I began to wonder about why not as background had been given for one character in particular, and why two other past-life memory aids kept being mentioned. It finally occurred to me that the author had a previous book entitled The Reincarnationist, and that is the term used to describe the troubling character. I need to do a bit of digging, but I bet he showed up in some of her earlier work. Rest assured, however, this book can and does stand on its own quite well.Will most certainly be seeking other books by this author.